We’ve got an update on Sony Pictures Home Entertainment’s Lawrence of Arabia Blu-ray release on November 13, 2012, which represents the high-definition premiere of David Lean’s (Doctor Zhivago) 1962 adventure epic. There’ve been a couple of changes concerning the release since Sony’s initial announcement in July, 2012. For starters, the Blu-ray will not be issued as a 3-disc edition, as we previously noted. According to a Sony announcement received on Aug. 6, 2012, Lawrence will be available in two configurations: As a two-disc set which includes an UltraViolet downloadable edition, and as a limited edition four-disc collector’s gift set. Well, technically, the four-disc set contains three Blu-ray discs, but the complete collection is comprised of four discs, one of them being a CD of the classic film’s memorable soundtrack by Maurice Jarre. Amazon lists the retail price of the four-disc collection as a healthy $95.99, but the Blu-ray is available through Amazon for a much friendlier $67.19. Sony has also officially announced the Blu-ray editions’ supplemental packages. The most intriguing bonus feature, a never-before-released deleted scene with an introduction by editor Anne Coates, is apparently only being issued as part of the gift set. The gift set will also include a 70mm film frame and an 88-page coffee table book. 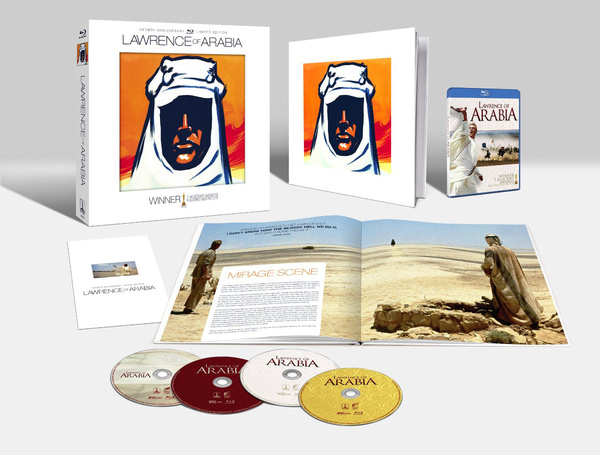 David Lean’s (Doctor Zhivago) classic 1962 epic adventure film Lawrence of Arabia, fresh from a 4K digital restoration and an international premiere at Festival Du Cannes in May, 2012, makes its Blu-ray debut as a 3-disc collectible boxed set. David Lean’s classic biography of the enigmatic desert-loving British soldier T. E. Lawrence (Peter O’Toole, The Stunt Man) who united Arab tribes in a battle against the Ottoman Turks during World War I was nominated for 10 Academy Awards and won seven, including Best Picture and Best Director. No word yet on the bonus features for the collection, but we’re sure it’ll be brimming with goodies along with an additional soundtrack CD. Check back for updates on the bonuses, pricing and more information on the running times, about which we have a couple of questions, ourselves! 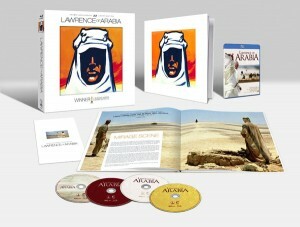 News: Lawrence of Arabia Blu-ray bonus features announced! 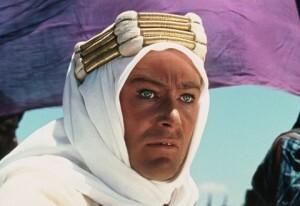 News: Lawrence of Arabia Returns to Theaters!